A classic and a favourite made keto-friendly. These Tandoori Chicken Kebabs are packed with flavour and nourishing spices. Grill, griddle or enjoy on the BBQ. And it’s a great keto recipe using turmeric so you can benefit from its anti-inflammatory, anti-oxidant and anti-aging properties! If you can leave to marinade overnight, it really enhances the flavour but of course if you’re in a rush you can just baste on the marinade and grill straight away. 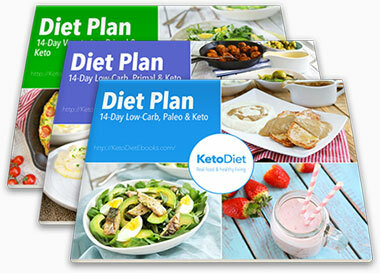 Who needs Indian take out when you can make a healthy, low carb alternative at home? 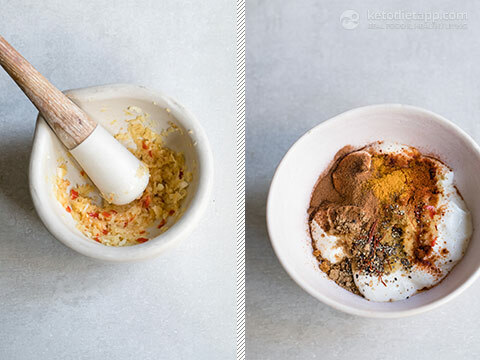 Especially when you can easily make your own curry powder! They are relatively high in protein so you may need to use a smaller chicken breasts depending on your macros. 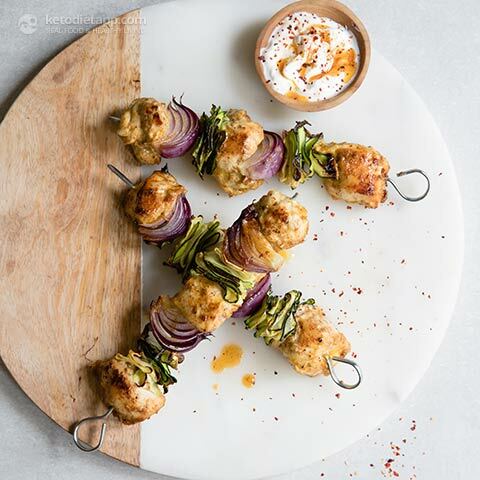 If your carb intake is ultra low, serve these tasty chicken kebabs with a bowl of dressed greens. Chop the chicken into ~ 2 cm/ 1 inch cubes. 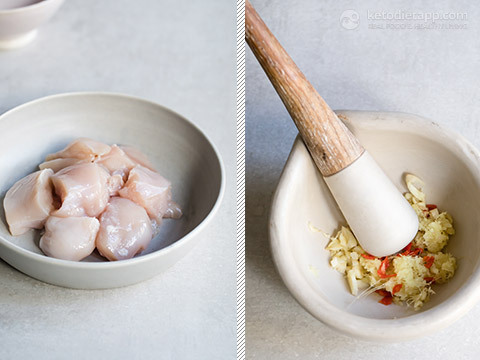 Mix the garlic, chili and ginger in a pestle and mortar. Add to a bowl and mix with the lemon juice and zest, yoghurt, spices and seasoning. Add the marinade to the chicken and leave in the fridge for at least 2 hours or overnight to enhance the flavour. Remove the chicken from the fridge and bring to room temperature. Make the zucchini ribbons using a vegetable peeler. 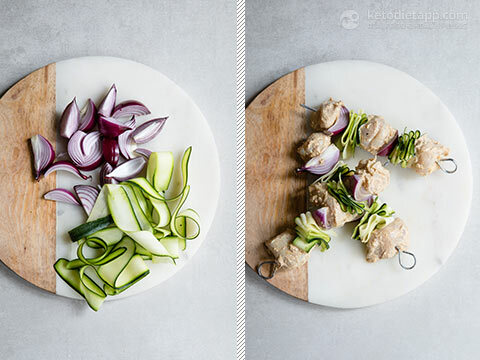 Thread metal skewers with chicken, zucchini ribbons and red onion. 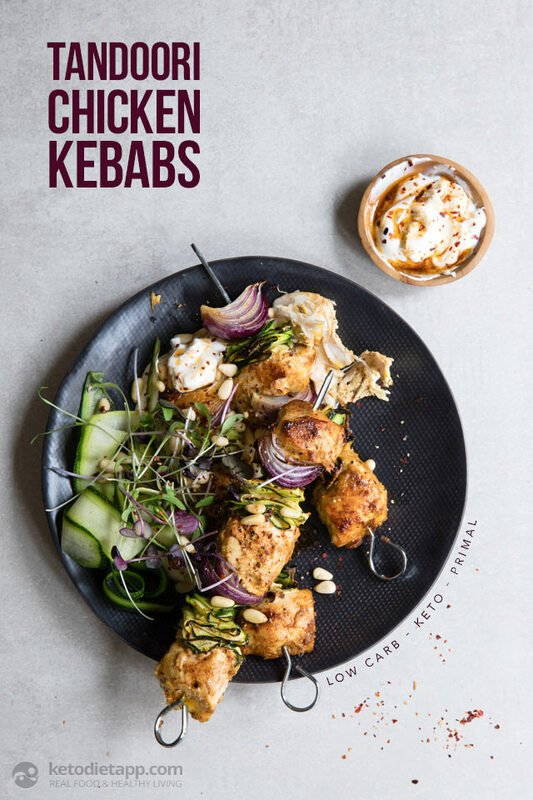 Line a baking tray with grease proof paper, add the kebabs and grill for 20 – 25 minutes until crisp and cooked through. Turn every 5 - 10 minutes for even cooking. Ensure the tray isn’t too close to the top of the grill to prevent charring. Drizzle with olive oil. Optionally, serve with crispy greens, zucchini ribbons and pine nuts. These kebabs are best served fresh or can be stored in the fridge and enjoyed next day. I love Indian cuisine. Tandoori Chicken was my first love when I was still able to more freely consume dairy and could try any dish. But as I have gotten older, my lactose intolerance has made my body so sensitive that I don't trust dairy with more than 2 carbs in it per serving. 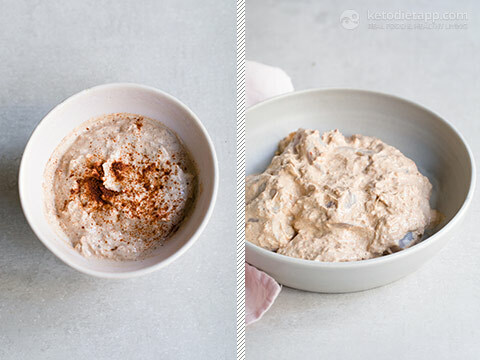 Can you recommend a lower carb dairy or non-dairy alternative to yogurt for the marinade that will still tenderize the meat? 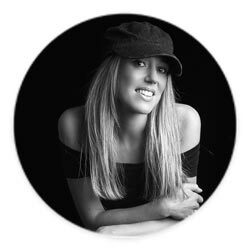 Hi Christina, I've had great results with coconut milk - especially Aroy-D (Amazon link). It has no additives and tastes amazing. It's made with 100% coconut and water. I would use about a third to half of a cup. I hope this helps!